Let it be known up front that I love Jillian Michaels. I think she is an amazing inspiration — given her own past history with weight issues and her ability to kick the crap out of anyone on The Biggest Loser — all the while empowering the show’s contestants to recognize that the potential for change is within them … if they’re willing to tap into it. I’ve learned a lot from her, read lots of things she’s written, and am a loyal30-Day Shred fan. 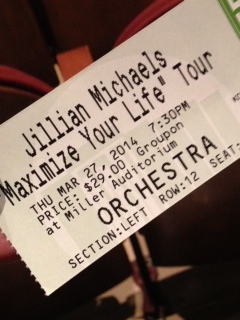 And whether you love or loathe her persona, Jillian is no doubt excellent at what she does. Shas cultivated an entire brand identity and become synonymous with health/wellness, serving as the Oprah (if you will) of the health/wellness sphere. (I often wonder if she’s gotten too big/has been straying from her brand, what with the marketing of her weight loss supplements, which just seems counter-intuitive to what Jillian often preaches … JMO). I think it goes without saying that I love to read about nutrition, fitness, and overall health. It’s a hobby, a passion, an interest — for better or for worse. I kind of have a girl-crush on Jillian Michaels, as do many other bloggers out there, apparently! I love her Shred videos, and am going to start listening to her pod-casts. I first heard about her new book, Master Your Metabolism, on LovINMyTummy yesterday. Though I don’t discuss my workout regimen a ton here, offline I’ve been Shredding for over three weeks (in addition to my cardio, plus P90X) and decided to give Level 3 a shot Monday night. However, I made the mistake of trying it AFTER doing P90X Plyometrics … oops. Why “oops?” you ask? Well, unbeknownst to me, Level 3 incorporates a ton of plyometrics … the same moves I’d just done in P90X minutes before. So I was basically over-doing it since I was feeling good and literally went from one DVD to the next … which meant I didn’t push myself as hard as I could have.